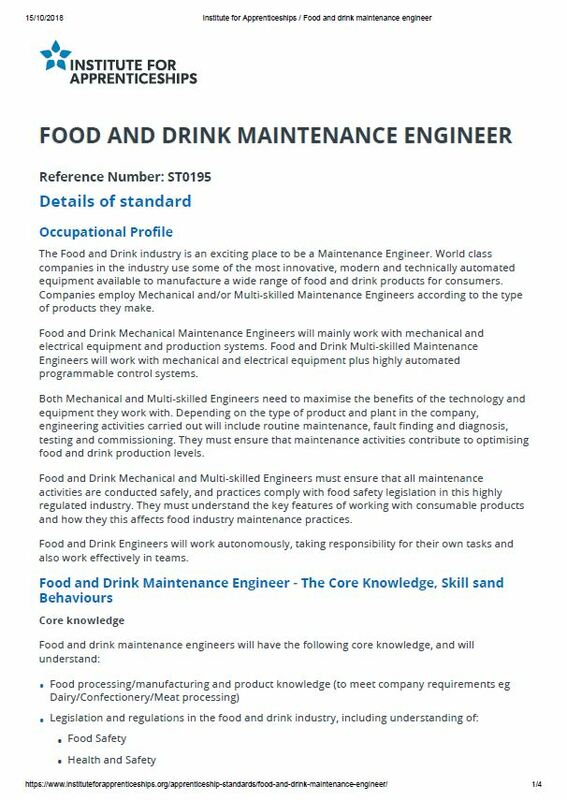 The Food and Drink industry is an exciting place to be a Maintenance Engineer. World class companies in the industry use some of the most innovative, modern and technically automated equipment available to manufacture a wide range of food and drink products for consumers. Companies employ Mechanical and/or Multi-skilled Maintenance Engineers according to the type of products they make. Food and Drink Mechanical Maintenance Engineers will mainly work with mechanical and electrical equipment and production systems. Food and Drink Multi-skilled Maintenance Engineers will work with mechanical and electrical equipment plus highly automated programmable control systems. Both Mechanical and Multi-skilled Engineers need to maximise the benefits of the technology and equipment they work with. Depending on the type of product and plant in the company, engineering activities carried out will include routine maintenance, fault finding and diagnosis, testing and commissioning. They must ensure that maintenance activities contribute to optimising food and drink production levels. Food and Drink Mechanical and Multi-skilled Engineers must ensure that all maintenance activities are conducted safely, and practices comply with food safety legislation in this highly regulated industry. They must understand the key features of working with consumable products and how they this affects food industry maintenance practices. Food and Drink Engineers will work autonomously, taking responsibility for their own tasks and also work effectively in teams.